How many of you suffer from Back Pain? Did you know 90% of Back Pain comes from Poor Posture? Today, I am speaking with our Pain specialist, AND Weight Loss Nation Mentor, Allison Hollister. Allison is a Licensed Massage Therapist, licensed in the State of Florida, who specializes in Structural Energetic Therapy. Weight Loss Nation is having it’s first LOCAL Event! Learn how to start LIVING a Long-Term Healthy Lifestyle and How to eliminate Pain so you can MOVE YOUR BODY! When you go to a conventional “massage therapist,” they will work on the areas of your body that you tell them is bothering them. As an example, If I told a massage therapist that I have lower back pain, the massage therapist will work on my lower back. When you go see a “Structural Energetic Therapist,” and you tell them that you have lower back pain, the Structural Energetic Therapist will say, “let me take a look at your posture.” From there, the Structural Energetic Therapist will determine the area, which is the “root problem” of your pain and will begin to work on that area of your body. The Structural Energetic Therapist is looking for parts of your body that are not balanced. Through body work, the Structural Energetic Therapist will work towards “balancing” your body, and get you moving in your body’s natural motion. This will eliminate your pain and allow you to move nautrally – without pain! How do you find a local Structural Energetic Therapist where you live? Go to Structural Energetic Therapy website and click on the “Find a SET Therapist” Tab on the top of the page, and click on the “State” tab to alphabetize the SET therapists by State. If you live in the Tampa, Florida area, especially in Lutz, Carrollwood or Westchase…..contact Allison Hollister to schedule your one-on-one session. You know the adage…..“It takes a village to raise a child.” The concept is the same with weight loss! Would you rather continue “yo-yo dieting” by yourself and not be able to go out to a restaurant with friends, since you know you will “struggle” with food choices? Are you happy with losing weight only to gain it back again? Do you have too much “stress” in your life? I’ve said all of those things and I’ve had every excuse in the book on why I couldn’t keep weight off. Would you like to be part of a “Village” of people, who are just like you and will be there to support you every single day in a private community? Weight loss Nation has a collaboration of experts in the fields of Nutrition, Mindset, Movement, Weight Loss, Yoga, Fitness, Meditation, Emotional Eating and Post Traumatic Stress! When you become a member of Weight Loss Nation, you have access to these experts to answer your questions! 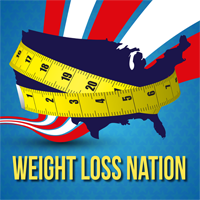 Weight Loss Nation Members* have access to recipes, cooking videos and exercise videos. Weight Loss Nation participates in “Meet Ups” in the Tampa Bay, Florida area. Our Private Facebook Forum is a “no judgement zone,” where you can feel safe and comfortable in sharing your comments and feelings. So…..what are you waiting for? Go to www.TheWeightLossNation.com and take the life-long journey with me and finally lose the weight forever! These show notes are written and produced for informational purposes only. Statements within this site have neither been evaluated or approved by the Food and Drug Administration nor a health practitioner. This site is not intended to diagnose, treat, cure or prevent any disease. Content should not be considered a substitute for professional medical expertise or treatment. This website, www.TheWeightLossNation.com, occasionally offers nutritional information for recipes contained on this site. This information is provided as a courtesy and should not be construed as a guarantee. This information is a product of online calculators such as MyFitnessPal.com, CalorieCount.com, Nutrifox.com, as well as from other sites. Although TheWeightLossNation.com attempts to provide accurate nutritional information, these figures should be considered estimates. Varying factors such as product types or brands purchased, natural fluctuations in fresh produce, and the way ingredients are processed change the effective nutritional information in any given recipe. Different online calculators provide different results depending on their own nutrition fact sources and algorithms. Furthermore, I am neither a chef nor a cook and I don’t pretend to be. I’m also not great in Math! Under no circumstances will Weight Loss Nation LLC. be responsible for any loss or damage resulting for your reliance on nutritional information, or any other information from this site, or the www.TheWeightLossNation.com website. Information is offered as an opinion and information may not be accurate. Due your own due diligence and make your own conscious decisions.